Ritchie Station Marketplace - Delmarva Site Development, Inc. 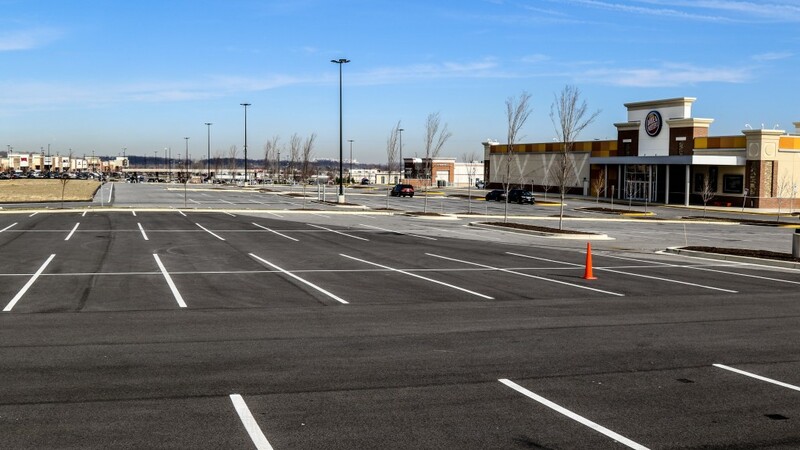 Located at the recently completed Ritchie Marlboro Road interchange on the Capital Beltway, Ritchie Station Marketplace is a large scale commercial development with over 1,000,000 square feet of available pad sites. This project represents one of the premier commercial developments in Prince George’s County because it boasts 1,000 feet of frontage along the Capital Beltway and is in close proximity to the last planned interchange along this highway. The site is now home to several national tenants including BJ’s Wholesale Club, Bed Bath & Beyond, TJ Maxx, Big Lots, Modell’s, Dollar Tree, DSW, McDonald’s, Pohanka car dealerships, Dave & Buster’s, Ashley Furniture, and Gold’s Gym. Delmarva first began working on the Ritchie Station Marketplace project in 2009 and has since provided multiple turn-key development packages for our client, NAI Michael. Earthwork, utility installations, conduits, site lighting, and final pavement are just some of the critical scope areas that we have completed for this high visibility project. Our team worked closely with NAI Michael to value engineer the design which reduced overall development costs throughout the project delivery. We want to help deliver your next project. Let our team show you what Delmarva has to offer. © 1999 - 2019 Delmarva Site Development, Inc.